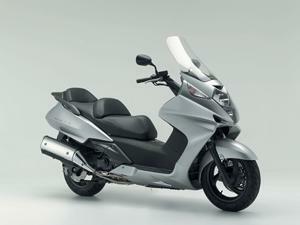 Honda’s Silverwing 600 has been joined by a 400cc version in the firm’s model line-up for 2006. The new version is aimed at filling a demand gap Honda has identified across Europe, according to the official launch at the Stade de France in Paris on Thursday night (Sep 29). An updated version of the 600cc step-thru was also unveiled to 300 journalists at the Paris Show preview. See below for Honda’s video about the new scooters. Keep checking back for more updates from the Paris Show as they happen.